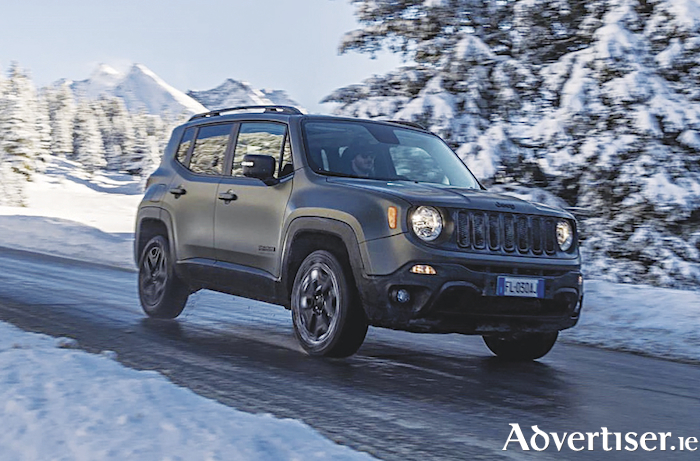 Jeep says its 2018 Renegade model range is refreshed and features a restyled interiors, enhanced specification, including the next generation ‘Uconnect’ infotainment systems featuring Apple’s Carplay/Android Auto. It has a new starting price of €21,950 for the 110 horsepower 1.6 e-torQ petrol engine. Adding that the uniquely styled and versatile 2018 Jeep Renegade comes loaded with specification across its three trim lines, Jeep's entry sport versions are now fitted with the next generation Uconnect™ infotainment system including 5” touchscreen display, USB/Aux-in ports and six speakers, Bluetooth® phone/audio streaming, 16-inch alloy wheels, multifunction steering wheel with audio controls and air conditioning. Offered in a choice of two engines; the petrol 1.6 e-torQ 110hp from €21,950 (which it says is a €1,000 price reduction versus previous model ) and the diesel 1.6 multijet-jet 95hp available from €23,200 (replaces the 120hp version at a €2,000 lower price ). Jeep Ireland says a price reduction of €1,500 versus the outgoing model on the Longitude trim is offered in a choice of three engines; one petrol 1.4-litre multiair turbo priced from €25,800, two diesel engines with 1.6 multijet-jet 120hp available from €26,450, and 2.0 multijet-jet 140hp all-wheel drive available from €30,450. In addition to these specification upgrades and price reductions, Jeep Ireland says it is offering customers a low rate hire purchase (HP ) finance at zero per cent APR or alternatively a personal contract plan finance rate of 2.9 per cent APR.